Assign with preventive and curative purposes for nematodes (toxocarosis, toxascaridosis, uncinoriasis, hookworm disease, trichocephalosis) and cestodoses (dipilidioz, echinococcosis, diphyllobothriasis, mesocestidosis and other tenidosis) of dogs and cats. 1 tablet of the drug contains albendazole – 0.25 g and praziquantel – 0.025 g (as active ingredients), as well as excipients. Alben C is a combined antihelmintic drug. The mechanism of action includes broad-spectrum nematodocidic and cestodocidic effects on all development phases of roundworms and tapeworms parasitizing dogs and cats. 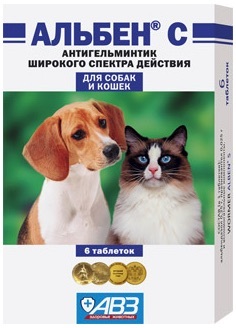 Alben C for dogs and cats is intended for individual oral administration in a single dose (1 tablet per 5 kg of body weight) with small amount of feed during a morning feeding. If canine/feline body weight is less than 2.5 kg, drug will be administered as aqueous suspension. For preparation disperse 1 tablet, suspend it in 10 ml of water, actively shake and administer immediately with syringe without a needle (1 ml of suspension per 0.5 kg of body weight). Previous starvation diet and cathartics administration are not necessary before animal deworming. Treatment: according to indications. Prevention: quarterly, in therapeutic dose. Do not use Alben C in pregnant and lactating females, as well as in puppies under 3 weeks old and kittens under 3 months old. Plain tablets with a scoreline on one side and logo (a cross in the center of shield) on another. 3 or 6 tablets in blister pack. Outer package – carton. Protect from light and moisture. Keep out of the reach of children and animals. Store separately from food and animal feeding at -5…+25°С.